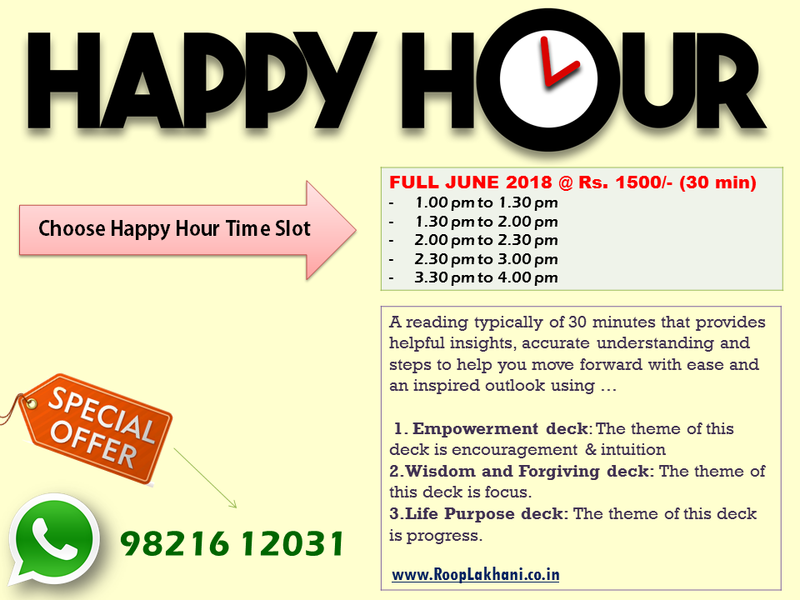 June is my birthday month and I am excited to give special soulful session during "Happy Hours"
A reading typically of 30 minutes that provides helpful insights, accurate understanding and steps to help you move forward with ease and an inspired outlook. I will be using different decks. 1. Empowerment deck: The theme of this deck is encouragement and intuition. 2.Wisdom and Forgiving deck: The theme of this deck is focus. 3.Life purpose deck: The theme of this deck is progress. b. Serve to remind you of who you truly are and therefore direct you towards progress. To book a slot of your preference, inbox me your details or call on 9821612031. telephonic appointment is also possible for people who cannot travel till Khar, Mumbai. I am an author, trainer, healer , coach, counsellor, consultant. I am a Mind designer. i use my creative and intuitive skills along with treasure of wisdom. Tarot, Numerology, Graphology, Emotions, Beliefs, Creating pathways and possibilities towards highest growth in any situations.